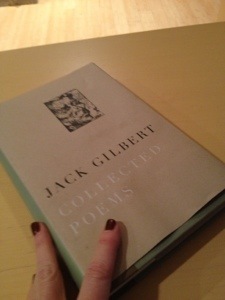 Before I left for my trip to NYC last week, I grabbed my hard bound copy of Jack Gilbert's Collected Poems. I'm almost always reading a novel, but I've been squirelly lately, unable to settle on any story, not able to start something new. I'm reading short work, magazine pieces, short stories- of course, but for this trip, I brought along my Gilbert. I especially wanted to re-read Refusing Heaven, Gilbert's collection from 2005. Here's a taste. I remember that house I'd rented with them. The laughing and constant talk of love. The energy of their friends. And the sounds late at night. The sound of whipping. Urging and screams. Like the dead lying to each other. Not poetry for the weak of heart. Jack Gilbert can be brutal, but his brutality is the kind that insinuates itself into your core and once it's in there, there's no getting rid of it. The day I returned from my trip, Jack Gilbert died. In my life before meditation, I would have remarked on this coincidence. Strange I'd lug this book with me just a few days before the great man died. In my meditative life, I no longer believe in coincidence. Jack Gilbert put out some strong energy into the universe and lucky for me a little bit of it seeped into my life.